Matthew Grant, President, Rotary Club of Tarporley devoted his Saturday to litter picking on the road from Tarporley to Utkinton. 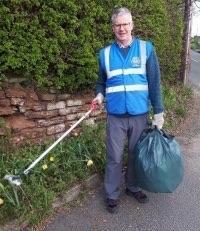 If you were sharpe eyed on Saturday 13th April and travelling from Tarporley to Utkinton then you may have noticed a lone figure litter picking along the road. That was our President, Matthew Grant who lives in the area. Matthew devoted his free time to picking litter of the verges of the road between Tarporley and Utkinton. He picked up enough rubish to fill four large refuse bags. The most interesting item being a bashed up drone! If he had not been spotted by a local resident his work would have gone un-noticed. I am sure you would like to join us in extending our thanks to Mathew for his hard work in keeping our beautiful countryside free of litter.